Pitch Solder Cup Interconnects terminate fine gauge wires and cables used in critical applications. Pitch solder cup headers and sockets from Mill-Max Mfg., Corp. come in a compact .050 inches and are ideal for wire and cable termination in critical applications, such as medical and industrial equipment. They feature closed captivity pins and receptacles that provide isolation between the soldering and interconnect areas. The male headers have .016 inch dimeter tails that make it easy for wire-to-board connections. The female socket is composed of a two pieces: a precision-machined outer shelled and a stamped beryllium copper internal contact. Mill-Max Mfg., Corp., North America’s largest manufacturer of Precision Machined interconnects is proud to present new, .050” (1,27 mm) pitch solder cup headers and sockets for termination of fine gauge wires and cables. 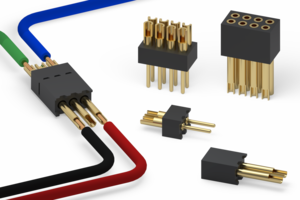 These solder cup connectors are ideal for applications that demand a highly reliable interconnect in a compact format. Our high quality, .050” (1,27 mm) pitch solder cup interconnects are the choice for terminating cables and wires used in critical applications such as medical and industrial equipment. The headers and sockets each feature closed cavity pins and receptacles providing isolation between the soldering and interconnect areas; keeping solder from contaminating the pin and socket connection. The solder cups are uniformly aligned to facilitate efficient soldering, especially useful for terminating cables, and can accept up to 26 AWG stranded wire. The male headers have .016” (0,41 mm) diameter tails suitable for mating with all Mill-Max .050” (1,27 mm) pitch SMT and through hole board mount sockets, perfect for making wire to board connections. The socket receptacles are a two-piece construction with a precision-machined outer shell and stamped beryllium copper internal contact designed for repeated mating while maintaining reliable contact over the life of the product. The insulator material is high performance Nylon 46 with excellent chemical resistance, mechanical strength and an HDT of 290° C to withstand most soldering processes. The standard plating option is gold, providing interconnect reliability, corrosion protection and wear resistance.